Samosas make or an Iftar! In this interesting new recipe, we share with you the technique for smoking the filling of the samosas before wrapping and frying them. Try these out on your menu this season and have you guests coming back for more. Dissolve Knorr Chicken Stock Powder in simmering water. Poach the chicken breasts in the stock for 10 minutes keeping the stock at a simmer. Once cooked, remove to cool down. Shred the chicken into pieces. Keep the remaining stock for a curry dish. In a pan or wok heat up 30 ml of Rafhan Corn Oil, sauté the vegetables and add the shredded chicken. Add the herbs, seasoning and sauces. Place the burning charcoal into the foil with a bowl shape. Place the oil inside the foil. Place the foil inside the pan or wok and cover with a lid for 5 minutes. This will allow the smoke to infuse into the ingredients. 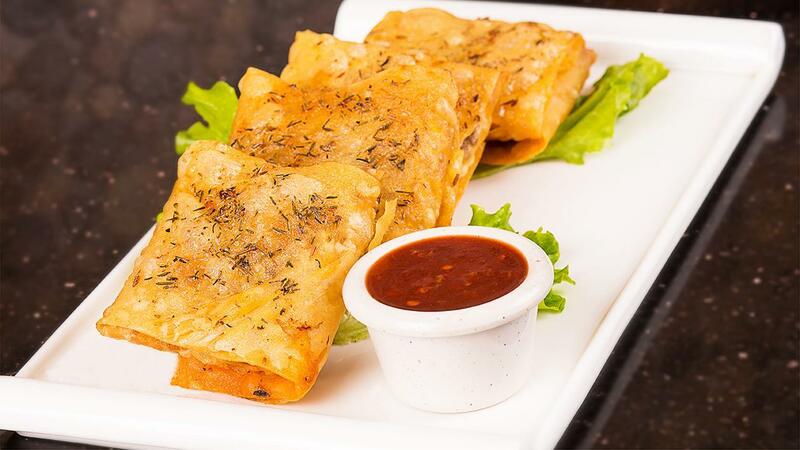 Fill the spring roll wrappers into traditional square shaped samosas. Use the eggs beaten, so a egg wash to glue the samosas. Deep fry samosa in moderate temperature Rafhan Corn Oil about 170°C - till crisp and golden all through. Drain on absorbent paper and serve hot with Knorr Chilli Garlic Sauce on the side.